Today we begin once again to approach the most holy days of the entire liturgical year. We invite you all to participate in the celebrations of Holy Week and the Easter Triduum. Our Diocese will celebrate the Chrism Mass at St Patrick’s Cathedral on Wednesday at 7:30 pm. At this Mass, Bishop Kevin Manning will bless the oils that will be used in the celebration of the sacraments over the next year and consecrate the Sacred Chrism. They will be presented to Fr Paul and representatives of our parish, and presented in our church prior to the commencement of the Holy Thursday evening Mass. There is not a morning Mass on Holy Thursday, Good Friday or Holy Saturday. The Easter Triduum begins with the Holy Thursday Mass of the Lord’s Supper at 7:30 pm. The Parish Centre is reserved on this evening as the altar of repose for the Blessed Sacrament. The main church doors will be used, with the parish centre entrance reserved for mobility access only. Please bring your Project Compassion box with you and Vinnies food donations also and place them in the baskets provided. Solemn adoration of the Blessed Sacrament, which continues after Mass, will conclude with Night Prayer (Compline) at 9:45 pm. Stations of the Cross will be prayed on Good Friday at 9:00 am, and the Sacrament of Reconciliation will be celebrated from 9:30 – 10:30 am. The church will remain open during the day for those who wish to come and pray. The main celebration of this day is the Celebration of the Lord’s Passion at 3:00 pm. If you have flowers to contribute to the Marian Shrine or other saints at Easter, please bring these down to the parish centre on Holy Saturday from 9:00 am – 10:00 am. The main celebration of this day and the entire Easter Triduum is The Easter Vigil at 7:30 pm. Finally, Easter Sunday Masses will be celebrated at 7:00 am, 9:00 am, 10:30 am and 6:00 pm. Our Penitential Service is on Tuesday at 7:30 pm, and the Sacrament of Reconciliation will be celebrated on Good Friday, from 9:30 to 10:30 am. Bishop Anthony will celebrate the Chrism Mass at St Patrick’s Cathedral on Wednesday at 7:30 pm. At this Mass, the oils that will be used in the celebration of the sacraments over the next year will be blessed, and the Sacred Chrism consecrated. They will be presented to Fr Paul and representatives of our parish, and presented in our church prior to the commencement of the Holy Thursday evening Mass. There is not a morning Mass on Holy Thursday, Good Friday or Holy Saturday. The Easter Triduum begins with the Holy Thursday Mass of the Lord’s Supper at 7:30 pm. The Parish Centre is reserved on this evening as the altar of repose for the Blessed Sacrament. The main church doors will be used, with the parish centre entrance reserved for mobility access only. Please bring your Project Compassion box with you and Vinnies food donations also and place them in the baskets provided. Stations of the Cross will be prayed on Good Friday at 9:00 am. The church will remain open during the day for those who wish to come and pray, with a Syro-Malabar Rite service during the day as well. The main celebration of this day is the Celebration of the Lord’s Passion at 3:00 pm. Finally, Easter Sunday Masses will be celebrated at 7:00 am, 9:00 am and 10:30 am only. To close the celebration of the Easter Triduum, we invite you to join us for Evening Prayer (Vespers) at 6:00 pm. Today brings to a conclusion the great celebration of the Easter Triduum. Once the sun set on Thursday, we entered into this celebration with the Mass of the Lord’s Supper. 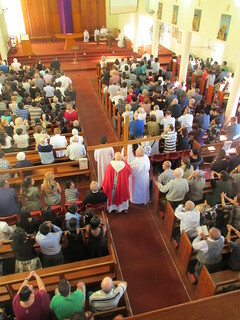 The second part of this three-day celebration took place on Friday afternoon with the Celebration of the Lord’s Passion. 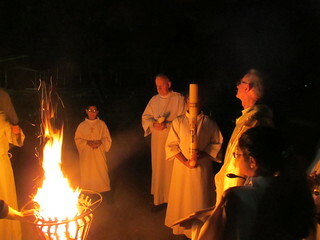 Finally, we resumed our celebration on Saturday evening by participating in the high-point of the entire liturgical year – the Easter Vigil Mass. 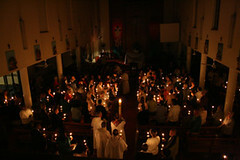 Each of these parts of the Easter Triduum is characterised by liturgical rituals that are unique to these great three days. 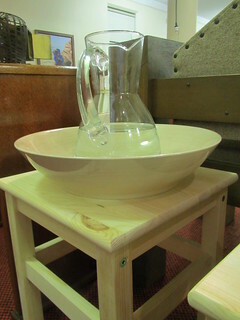 At the Mass of the Lord’s Supper, Fr Paul knelt down before his parishioners and washed their feet. In this ritual, we are reminded of Christ’s commandment to love one another, and the way Jesus challenged the disciples to live out this command. We engage in the washing of feet each year not as some role-play or historical reenactment, but because we too, as disciples of Jesus, are called not to be served, but to serve. 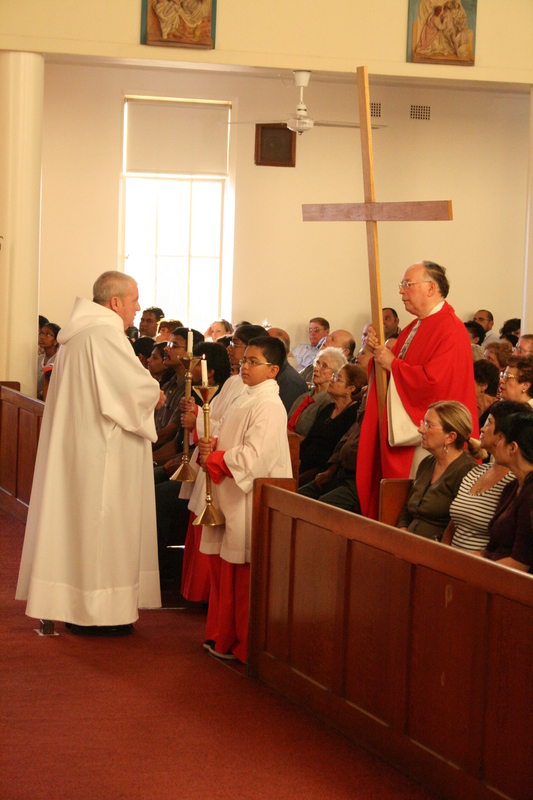 On Good Friday, hundreds of us came forward to venerate the cross. On this day, we celebrate what is very much our Good Friday. Although Christ died as he hung upon the wood of the cross, as the ritual reminds us, Christ is the salvation of the world. We continue through to Easter with the hope of that salvation. Finally, the Easter Vigil begins with the Service of Light. The pillar of fire led the Israelites at that first Passover, through suffering and slavery to new life. Our pillar of fire, the Paschal candle, leads us to our celebration of Christ’s Passover, his passing over from death to new life. Guided by the light of Christ, we recall the history of our salvation, celebrate the resurrection, and initiate new Christians into Christ and his Church. May God bless you all during this time, and over the fifty joyful days of the Easter season. For the first time this year, Bishop Anthony will celebrate the Second Form of the Sacrament of Penance in each deanery. The Holroyd deanery celebration is this Thursday 14 April at 7:30 pm at St. Patrick’s Church, Calliope Street, Guildford. All are invited to attend. Palm Sunday will be celebrated at the usual Mass times. 9:00 am Mass will commence with a procession from outside the parish hall. 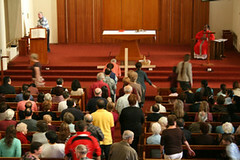 Please join in the procession or solemn entrance at the Mass you attend and enter fully into the spirit of Holy Week. The parish Penitential Service will be celebrated on Tuesday 19 April at 7:30 pm. Like last year, readers for the Easter Triduum will have a preparation workshop afterwards. The Diocesan Chrism Mass is on at St. Patrick’s Cathedral on Wednesday 20 April at 7:30 pm. All are invited to attend. Fr Paul and parishioners will receive from Bishop Anthony the oils that we will use over the next twelve months in our sacramental celebrations. The Easter Triduum begins with the Holy Thursday Mass of the Lord’s Supper at 7:30 pm. The Parish Centre is reserved on this evening as the altar of repose for the Blessed Sacrament. Please remember that entry that evening is via the church doors – if you cannot manage the stairs, please see our welcomers about using the ramp and parish centre entrance. Please bring your Project Compassion box with you also and place it in the basket near the church entrance. Stations of the Cross will be prayed on Good Friday at 9:00 am., and the Sacrament of Penance will follow from 9:30 – 10:30 am. The church will remain open during the day for those who wish to come and pray. The main celebration of this day is the Celebration of the Lord’s Passion at 3:00 pm. Like Holy Thursday and Good Friday, there is no morning Mass on Holy Saturday. If you have flowers to contribute to our adornment of the Marian Shrine or other saints, please bring these down to the parish centre from 9:00 am. – 10:00 am. The main celebration of this day and the entire Easter Triduum is The Easter Vigil at 7:30 pm. Mass will begin outside with the Service of Light, before we proceed behind the Paschal Candle into the church. Finally, Easter Sunday Masses will be celebrated at 7:00 am., 9:00 am. and 10:30 am. only.